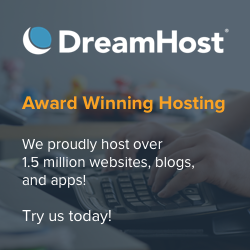 Home » Homepage » Second Life: The Most Used Social Media Tool – By FAR! Almost everybody who’s reading this article has grown up with metrics on the ‘net. From the very beginning, Internet Service Providers were happy to tell everybody how many users they had (assuming they had a lot, of course); I remember the wars between “active paying users” and “number of email addresses”, perhaps the first time the issue about metrics was raised. With the Web, we entered a new stage, where the most important metric was first “page hits” (good for techies, since they will have to tailor their hardware and software for handling the load on a server — page hits is a good metric for that), and later “unique visitors” (which reflects more realistically the number of people actually visiting a site — good for marketeers to measure the impact and interest of a site, and for advertisers, to figure out the size of their audience). With the rise of all sort of traffic bots and crawling engines and lots of similar tools that extract, index, and process data, Nielsen//NetRating has proposed a different metric, which they feel to be quite more appropriate for the current generation of Web applications: time spent viewing a specific site. I’ve already commented quite a lot on this subject on the summer of 2007. This not only makes more sense when you consider that people take time to be online as opposed to, say, watch TV or listen to the radio. Since the day still sadly only has 24 hours, and we waste a lot of it sleeping anyway, measuring the percentage of the time spent viewing web sites instead of watching TV is quite more important for correctly establishing metrics. The Internet truly became “just another medium” when Nielsen//NetRating started to push their new metrics. The beauty of it is that the Internet, of course, is not “just Web pages” these days. In this early 21st century, we have an awesome new thing running on top of the Internet: online virtual worlds (either games or social online platforms like Second Life®). Sadly, there is no easy way to measure its “impact” using “page views” or “unique visitors”, although it’s usual to tell things like “number of registered users”, “number of active users” (for a given value of what “active” means), and “number of simultaneously online users” (ie. concurrency). These have no parallel with the Olde Webbe, where people hardly use those metrics. Ironically, “retention rate” has been recently featured by many sites — ie. it’s quite a novelty to hear that Twitter actually loses 60% of their registered users after just a month (Facebook allegedly only loses 30%). Churn rate — the percentage of users lost per month — was popular with ISPs in the late 1990s, but not so much after the first dot-com bubble burst (yes, we’re going through the second one 🙂 which might have a lesser impact than the first, since we’re through a financial crisis at the same time, while the 1990s were a decade of world-wide economic boom). So, except for “number of users”, there seemed to be no easy way to compare what 2 billion users were doing on web pages with what a projected half a billion virtual world users in 2009 were doing (feel free to discredit those numbers; they’re hard to estimate anyway). We have that option now. While “simultaneous logins” or “traffic” in SL might be artificial metrics, one thing is for certain: Linden Lab can quite accurately measure (more so than on web pages) how long people spend in Second Life. Hamlet Au provides some insights: sure, WoW is played quite a lot everywhere, but SL residents use SL quite more than WoW, and that’s the whole point really: SL is very sticky — if you like it, you use it a lot (if you don’t “get it” in the first hour, you’ll never use it ever again). This is actually a quite important piece of information. Second Life has twice the registered users as World of Warcraft, but WoW is way more used than Second Life — although the ones that use SL, use it longer than WoW. However, all (or almost all) registered WoW users are paying customers (thus, Blizzard had over a billion US$ of revenue in 2008), while Second Life is, well, used at most about 10% of all registered users, of which 2.5% or so log in regularly. The issue here is that the 11.5 million users logging to WoW understand what WoW is about and are willing to spend time — and money, a lot of money for Blizzard — to use it every day, while 15.5 million Second Life registered users, by contrast, rarely (ie. only one in ten) understand what’s all about, and even so, out of those, only 1 in 4 will regularly log in. On the other hand, those 1 in 40 that actively use Second Life regularly use it a lot. Really a lot! Remember, the above statistic just shows gaming activity, either single-user or multi-user. We just happen to get Nielsen to bundle SL with it, or we wouldn’t ever see any statistics at all. Gaming, of course, is an activity that takes a lot of time, and it tends to be highly addictive — in the sense that when you’re playing a game you’re not doing anything else for a few hours per day, e.g. not watching TV! 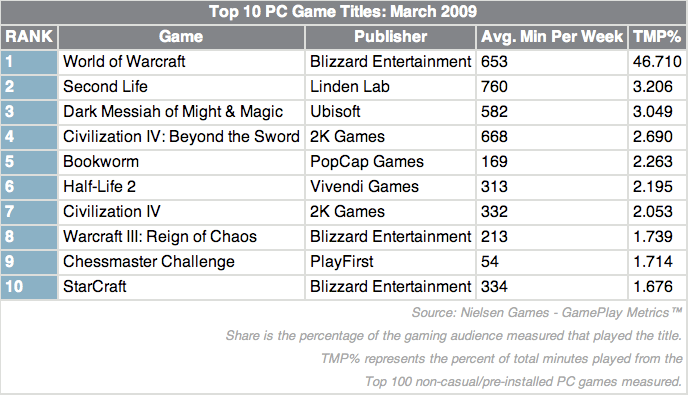 Second Life, however, competes far less with “games” than with social tools. The point for SL evangelists like me is that SL is a new generation of social tool, where picture sharing, video sharing, blogging (3D blogging — your home is your blog), IMing, group chat/discussion, etc. are all built-in the same platform, but done in 3D, and in real-time (not assynchronously like on Twitter/Facebook, but real-time like on IRC and MUDs). While SL can be used for gaming and artistic, non-social use (that’s the beauty of the platform, it can do everything 😉 — even though a jack-of-all-trades tool tends to be poor on specific uses), it’s the social and business environment inside SL that is more prevalent (ie. while a lot of people role-play in SL and join RPG games, the majority meets friends, goes out shopping and attends live concerts 😉 ). This makes it more suitable to compare SL, as an alternate social networking tool, with other 2D Web-based social tools. How do these fare, compared with Second Life? Wow! If those numbers are right, what does this mean?? Mostly, that pretty much nobody is using any of those 🙂 At least compared to Second Life, the difference is huge. They simply don’t gather any interest at all. They’re time fillers, i.e. things you do between one thing and another (send an email, tweet about sending an email, see a reply which has a link to YouTube, watch the video, get back to work). While Second Life totally grabs your full attention for hours a day. (Of course you can also tweet while on SL, but the main focus will be SL, just quickly following your timeline on any Twitter app — even one inside SL — to make sure you’re not missing anything, but your focus will turn back to SL after that). Clearly it’s a question of expectations. The point here is what is more valuable in terms of a marketing strategy: the sheer number of consumers, or the time they spend using a service? The answer is probably “both”, although, in my experience, time spent using a service, in the long run, is more lucrative. Blizzard knows that quite well! That might explain, for instance, why World of Warcraft generates revenues of over a billion dollars, that Second Life’s internal economy will generate half of that in internal transactions, but…. Facebook, Twitter, YouTube, and very likely MySpace, are all companies with serious losses of millions a year, just happily burning venture capital until they get bought. So, to recap: if you have a lot of users, you’re unprofitable, they will use the service little, and you won’t make a profit out of that. Having less users — “merely” a few milions, instead of hundreds of millions — but grabbing their attention fully — leads to a successful business model that turns your idea into a very lucrative company. One wonders, then, why journalists are happily tweeting but still dissing Second Life as a “failed experiment”. Mitch Wagner on InformationWeek asks the same question and shakes his head at his fellow journalists with their sloppy news. On the other hand, Second Life is mostly seen as “the media hype of 2006/7”, while Facebook and Twitter are the media hype of 2008/9 — the big question is what happens if the media tires of Twitter too (or perhaps I should ask “when”, not “if”?). What will happen then to the company behind it? Second Life grew even more after the “hype peak”, to over three times the number of users and overall landmass. These days, the “lack of media hype” doesn’t affect SL’s steadily growth of 10-15,000 new users per day — a number that remains constant since 2006 at least. However, the comments both on InformationWeek and Massively clearly show a trend: after a decade of Linden Lab’s existence, most people still haven’t understood what Second Life can be used for. They still get bored. It’s incredible for us regular SL residents, but true. And what this means is that most people will still have a major difficulty in understanding how it works at all. And what they don’t understand, they don’t use. Thus the incredibly high churn rate of SL compared to everything else in the world. Twitter is the typical example of an idea done well. You register and are tweeting in seconds. There is absolutely nothing to learn. Facebook is quite another beast, and I’m actually surprised that it has a higher retention rate than Twitter — it’s not that easy to configure at all or to understand what you can use it for. MySpace has increased the number of tricks to make it simpler to get your page working, but to get relatively good-looking results, you’ll have to spend some time with it. Contrast all that with Second Life: at the very least, you’ll spend an hour just to figure out the basics (moving, inventory, teleporting). But to truly understand the purpose of Second Life (note: the purpose, of course, will be different for everyone), it’ll take you a long time, measured in months if not in years. Now that’s a way too high learning curve! And, since it’s so high, it means that most people will never bother with it. I don’t know how you can make it simpler. It’s like expecting that someone who never saw a computer before becomes proficient with installing Windows, launching Internet Explorer, joining Gmail and getting an email address, adding Wikipedia and Google Search to the browser’s toolbar, and becoming immediately proficient with “the Internet”. It’s impossible. In an hour, you can barely cover the whole gamut of options and choices that you can put “the Internet” to use. Even if you skip the installation part, explaining someone how to use email or searching in Google will take the better part of an hour. Yes, of course, there are moments of instant gratification when you finally find out something you’re interested in. But jump from these very easy skills to teach people how to create profiles on forums that interest them, start a blog, or sign up to a trillion social media tools, or to subscribe to YouTube channels or RSS feeds… that takes weeks, or months, or years, if you’re an Internet newbie. In the Western world, there are less and less “Internet newbies”, so of course that for them joining Twitter is easy. Try to explain the concept of lifeblogging to someone who never saw a computer before and you’ll see what I mean. Second Life is exactly like that. It’s a highly complex network of personal relations interwined with activities, a society, an economy… a world. And grasping all that “in a few minutes” is impossible. Even a “SL Lite Viewer” will just barely help — it will remove the obstacles of joining, but it will not make it easier to stay. I sometimes compare the experience of joining SL to moving to, say, an university campus on another city or even on another country. You can read about it (online) to get an idea of what courses will there be for you, and where you’ll be able to rent a room. But then you’ll drop into the campus, and suddenly there are tons of things that no site told you: like how and where you pay the rent for your room, or where you will need to show up for classes, or how you submit your work for review by the professors — or even where you get your username and password for the intranet to do that. The few hours on the campus are totally baffling and you just seem to be walking into walls — figuratively speaking. After a few days, some things will start making sense. On the second year, you’ll be laughing at how clueless the freshmen behave and can’t possibly imagine that you went through the same steps. Second Life is just like that. By contrast, joining Twitter is just like going to the movies: you only need to figure out where the theatre is, buy a ticket, ask some friends to go with you, and enjoy the movie. That’s it. Simple. The point is, while on the campus, all your life will be, in a way, connected to it — even when you’re physically away from the campus, you’ll still be talking to friends and colleagues and keeping in touch and thinking about assignments. Living on the campus is an immersive experience which dominates your life’s focus. Watching movies, well, is immersive for an hour or two, and you’ll certainly talk about the movie with your friends afterwards, and eventually even buy the DVD or watch re-runs on TV later on — so it’s not as if the movie ends when you leave the room — but it’s “just something you do” to have some fun, once in a while. The difference, of course, shows in the numbers: SL residents spend hours immersed in the virtual world environment — and when they leave it, they go away to blog about it, or tweet about it, or just keep in touch with their SL friends on other social media tools, and so on (I found it intriguing that Plurk’s success seems to be at least partially attributable to the sheer amount of SL residents who adopted it as their lifeblogging medium of choice, although obviously almost all are on Twitter and Facebook too). But that comes at a price. 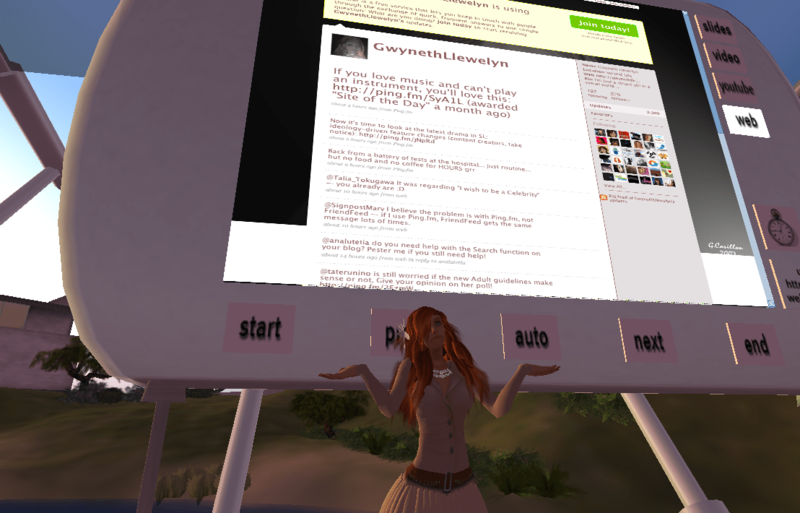 “Understanding” the culture of, say, Twitter, takes 15 minutes (yes, you can take classes about Twitter in SL too). Understanding the culture of Second Life takes months, even on a “speed course”. Thanks for Tateru Nino for pointing me to Hamlet Au’s article on New World Notes.